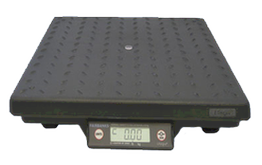 The Fairbanks Ultegra 29824C USB powered shipping scale has a capacity of 150 pounds and a readability of 0.05 pounds with a 14 x 14 inch weighing surface. For more than a decade, the Fairbanks Ultegra® Parcel Shipping Scale has been a popular choice for mailroom shipping operations worldwide. 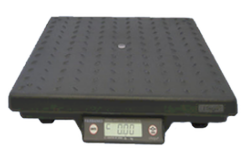 This rugged and reliable scale is also suited for use in a variety of other non-washdown, general weighing applications up to 150 lbs. The Ultegra is made of a high-impact gray ABS composite material that makes it lightweight, yet extremely rugged. The composite material is reinforced with molded structural ribs that provide up to 300 percent overload protection. The Ultegra is designed to control deflection, which significantly increases accuracy. It also provides repeatable load introduction for the highest degree of precision offered. The Ultegra’s textured weighing surface reduces surface tension and allows boxes to slide easily across the scale. To maximize operator efficiency, a roller top model is also available.